A pilot project led by Continental, together with a specialist hydraulic engineering company, carried out the development of a new generation of the Big Bubble Curtain, which has been already tested successfully. More energy efficiency and fewer greenhouse gases and as soon as possible – these are the declared objectives of the German “Energiewende”, energy turnaround. The expansion of wind power at sea is therefore under high pressure. Currently, offshore wind farms with a total output of more than 5.3 gigawatts are in operation in Germany. By 2030, wind turbines on the local coasts are expected to reach a total capacity of 15 gigawatts. According to the German Offshore Wind Energy Foundation, this could generate clean energy for up to 15 million households. In order to achieve this, new wind farms are being built in the North and Baltic Seas. But for marine life, these projects mean one thing above all else: all sorts of construction noise and vibrations. Mammals such as protected porpoises, but also seals or fish like cod and herring use sound to orient themselves, to communicate, and to locate prey and predators. To protect the animals, a noise level of no more than 160 decibels applies in German waters at a distance of 750 meters from the construction site. This legal requirement of the Federal Ministry for Environmental Protection Building and Nuclear Safety has spurred the development of new technologies for the quiet installation of foundations. 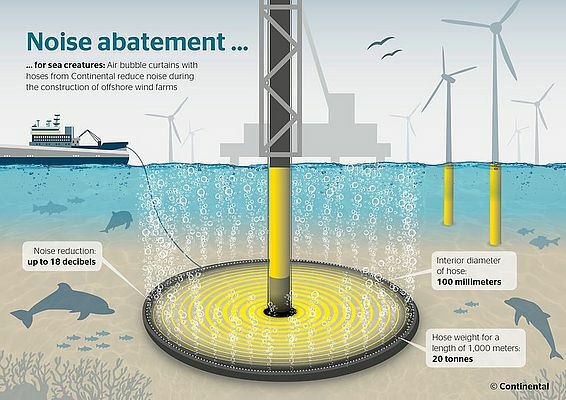 When installing wind turbines, the foundations (which are up to eight meters thick) are driven as deep as possible into the seabed. Otherwise, wind and waves would simply knock them over. Each individual impact causes enormous noise of up to 225 decibels. This is about twice the amount of noise as a circular saw and can be heard for miles in the sea. “An air bubble curtain is created by using one of our heavily perforated hoses. The installation company places this around the construction site as a ring, before the wind turbine towers – which are up to 150 meters high – are driven into the seabed. The hose ends are connected to powerful superchargers on ship decks. During the work, they pump 10 bar of oil-free compressed air into the hoses, which escapes through the holes according to a well-defined pattern. The result is a curtain of millions of small bubbles that rise to the water surface, forming a kind of whirlpool around the construction site. The air bubbles change the density of the water and thus break down the sound waves. Depending on the nature of the soil and water currents, hydraulic specialists also use two-ring technology,” explains David Hoffmann, who is responsible for industrial hose solutions in the EMEA and APAC region for the Continental Corporation. “This clever technology reduces the noise level by up to 18 decibels, which is a volume reduction of 95 percent,” Hoffmann continues. But how can the hose remain at the bottom of the sea without additional steel chains when the pressurized air provides buoyancy? With the aim of finding a solution to this challenge, the development partner commissioned the hose experts from Continental. 35 kilometers northeast of the island of Rügen lies the construction area of the Arkona Basin Southeast wind farm. From now on, 60 wind turbines with an installed capacity of 385 megawatts will supply 400,000 households with clean electricity. At the end of last year, Continental tested the further developed hoses there. The result: The gigantic hoses from Continental have passed the field test with flying colors. Several installations ran parallel at the same time. The Big Bubble Curtain hose system worked perfectly during the construction work at a depth of 60 meters. It remained stable on the seabed while air bubbles reduced noise and vibrations by 95 percent.